Over our years of ministering in Uganda, it is the children who pull at our heartstrings. Most of the children live in abject poverty. They are typically undernourished and have only one or two sets of tattered, dirty clothes to wear. 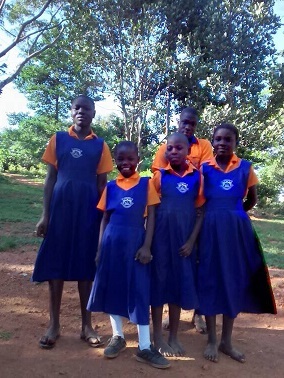 Most are not in school because their caregiver simply does not have the money for school fees and the required uniform. The reason I use the term caregiver instead of parent is that oftentimes, one or both parents are deceased (usually from AIDS), and the children are being cared for by an Aunt, Uncle, Grandparent, or what is called a “Child Head of Household” – meaning that the oldest child is taking care of all his or her siblings. The picture on the left shows three unsponsored children . None of these children are in school, and the clothes they are wearing are probably the only clothes they have. Without an education, these children have virtually no chance to improve their conditions, and they enter into a cycle of on-going poverty. Oftentimes, the young ladies get pregnant and/or get married at a young age because they believe it is the only way for them to survive. Some even resort to prostitution to put food on the table to feed themselves and their families. An education can break the cycle of poverty – something most people take for granted. Many of the children suffer from having worms, jiggers, malaria and other maladies. Their caregivers simply don’t have the small amount of money needed to pay for the medicine to treat these very treatable conditions. Our goal is to sponsor children through Secondary School, which is equivalent to High School here in the US, however, if you need to cancel for any reason, just let us know. Sponsors receive a picture of their sponsored child and at least one letter and picture from your child each year, including periodic email updates about the ministry.